BOULDER, Colo.--(BUSINESS WIRE)--Rapt Media, a national leader in groundbreaking interactive video technology, today announced a new survey report affirming the depth of disengagement among U.S. employees. According to the report, U.S. Employees: Detached, Disengaged, and Disenchanted, respondents feel underappreciated and disconnected, and many believe their internal communications and training programs need significant improvement. Results highlight the lack of innovation, personalization, emotional connection and creative thinking in the internal landscape. The report also includes recommendations for business leaders – specifically leaders in human resources and internal communications – to cultivate internal brand loyalty through better content, innovation and authentic employee connections. “Given that most employees are either open to other opportunities or actively seeking their next job, the unfortunate truth is we can no longer take employee loyalty for granted," said Trautman. "Now more than ever, we must earn that loyalty through better engagement, training and internal communication." 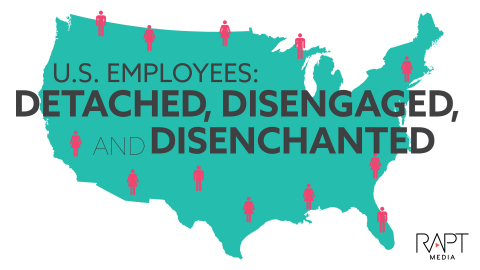 Download the full report to uncover more insights from U.S. Employees: Detached, Disengaged, and Disenchanted. Rapt Media offers compelling alternatives to engage and educate employees and consumers. Our cloud-based interactive video platform enables meaningful participation, resulting in more relevant communication, deeper learning and rapid behavior change.